Technology is a key gateway to supporting all learners especially those with dyslexia. Dyslexia friendly teaching approaches can be learner friendly to all, particularly when they use technology. Print our mind map or review the text version below to find out more. 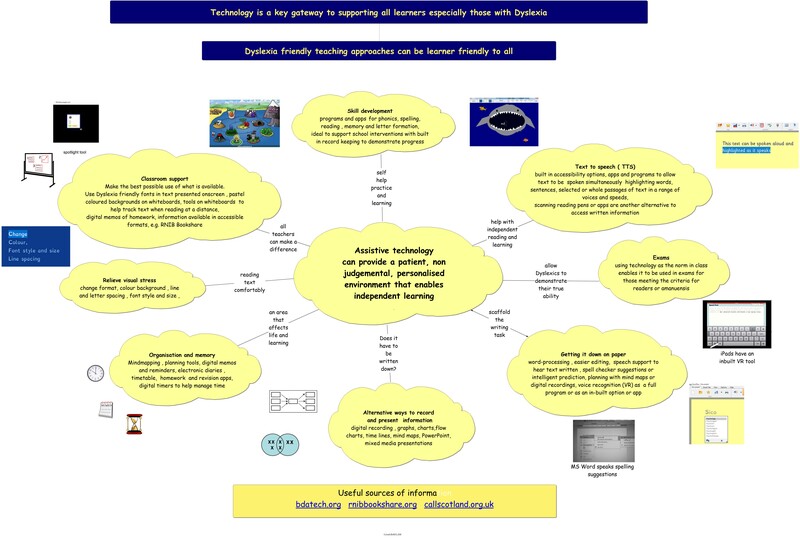 Download the mind map as a PDF or image (links open in a new window). Can provide a patient, non judgemental, personalised environment that enables independent learning and levels the playing field. Does it have to be written down? Relieve visual stress: change format, colour background, line and letter spacing, font style and size. Text to speech (TTS): built in accessibility options, apps and programs to allow text to be spoken simultaneously highlighting words, sentences, selected or whole passages of text in a range of voices and speeds, scanning reading pens or apps are another alternative to access written information.